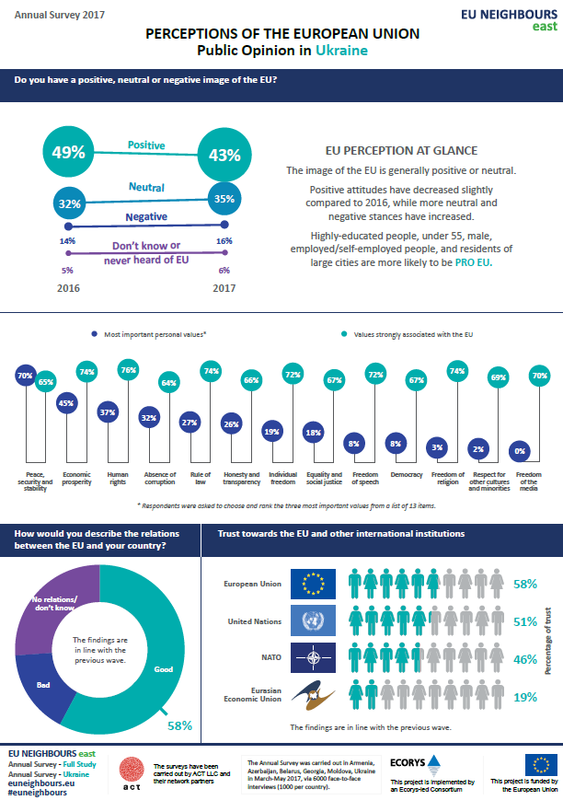 43% of Ukrainians have a positive image of the EU and 58% Ukrainians believe relations with the European Union were good. More than 70% of Ukrainians believe that the EU represents values such as human rights, economic prosperity, rule of law and individual freedoms. 58% of people in Ukraine trust the European Union, compared to the United Nations (51%) and NATO (46%). More than half of Ukrainians (56%) are aware of the EU’s financial support, and 36% of this believe that the support is effective (up from 34% last year). The Eastern Partnership regional overview report and factsheets are available here. To find out more about EU – Ukraine cooperation and partnership, go here.